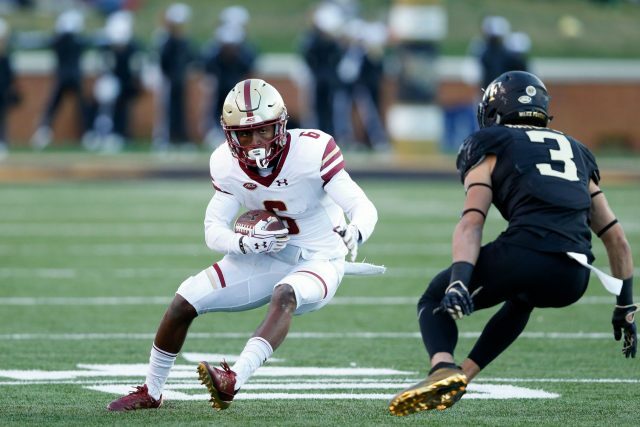 Jehlani Galloway is using the off-season to sharpen his skills after being a redshirt freshman for the Boston College Eagles. After playing in the first two games of the Eagles’ 2018 campaign, head coach Steve Addazio and his staff decided to redshirt Galloway. In prior years Galloway would have lost one full year of eligibility after being on the field for one game. The new NCAA rule says a student-athlete can play up to four games before being redshirted without losing the year of eligibility. Galloway was thankful for the decision. “The team was senior-heavy and I wouldn’t have seen much playing time as a true freshman,” Galloway said. Some of the reasons for redshirting could be medical related, too much depth at a position and player performance. Galloway plans on capitalizing on the new rule in 2019. “I knew coming to Boston College was going to be a challenge. The number of hours it takes for schoolwork, combined with learning the playbook took some getting used to. I love it though and wouldn’t have it any other way.” Galloway said. The troubles of coming from a well-coached, but small Providence, Rhode Island program were real. Memorizing the precise actions of the Eagles’ game plan was a daunting task. Along with the academic strength of Boston College, it would definitely take some getting used to. The new redshirt rule allows intelligent and talented student-athletes an extra year to get comfortably acquainted with the strenuous new lifestyle. The Eagles 2019 winter workout sessions have begun and Galloway is now on the go from 7 a.m. to 11 p.m. every weekday. The after workout meetings with quarterbacks, running backs, and wide receivers are meant to bring the players up to speed on the playbook. “Every night I have to do my homework and then study the playbook for at least 30 minutes, the meetings are not enough,” Galloway said. The 6-foot-1, 190-pound Galloway is also using the offseason workouts to get bigger and stronger. “Speed was never my issue, I ran a 4.48 40-time at the BC camp,” Galloway said. Jehlani is focused and poised to make an impact on the field for the Eagles in 2019. “I was one of the skinnier receivers, the extra year is helping my size. Hopefully, I can get on the field and really help my team next season,” Galloway said. Galloway also hopes to be part of a small legacy with Boston College football. Two banners of Rhode Island-born, former NFL, players hang in Alumni Stadium and Galloway would like to be up there with them someday.